Although best known for her acclaimed role as the feisty Lupita in the visionary television series “Weeds,” it’s Renée’s trademark versatility that’s placed her in a very special acting niche. 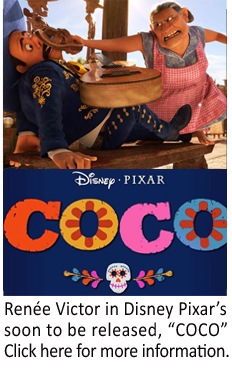 Her unique talents will be showcased this fall as Abuelita in Disney-Pixar’s animation film “Coco.” Numerous media outlets have already generated a stir, comparing “Coco” to some of animation’s greatest films. Renée’s journey to “Coco” caps a career brimming with high critical marks. Besides her signature role as Lupita in “Weeds,” others include “E.R.,” “Tyler Perry’s House of Payne,” Robert Duvall’s renowned “The Apostle,” and her award-winning titular role in “Libertad” for which she won Best Actress at the Napa Valley Film Festival.